The Compulsive Reader: Space Saver! A hanging corner shelf! Very convenient when you don't have much wall or floor space! CSN, a great online store that has bathroom vanities, office furniture, kitchen supplies, and more. They've offered me another bookcase, and since I am so short on space, this one seems like the perfect choice! Lucky! I've had my eye on that for a long time now. I've got no space on the floor for furniture so that'd fit perfectly. Cool. This is the one I'm putting together right now. I got it in espresso. That's what I need too! I also have an award for you at my site. You can go here to view it. 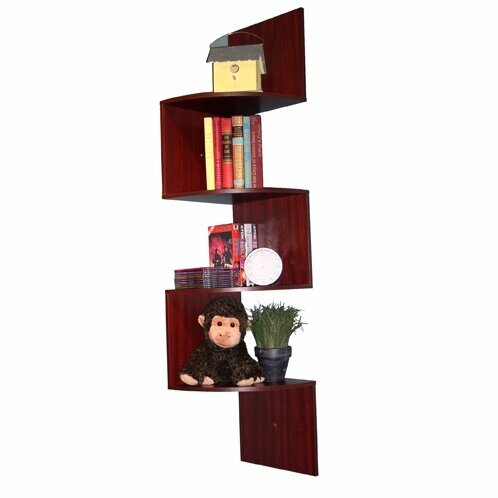 I think the monkey will have to go... space for at least another six books there? And how about glass floors that lift up to allow access to the books stored under the floor? And surely you don't really need a fridge? or a washing machine? More space for bookshelves there. And do you really need a bed? I don't think you've given this problem enought serious thought... There are so many possibilities!